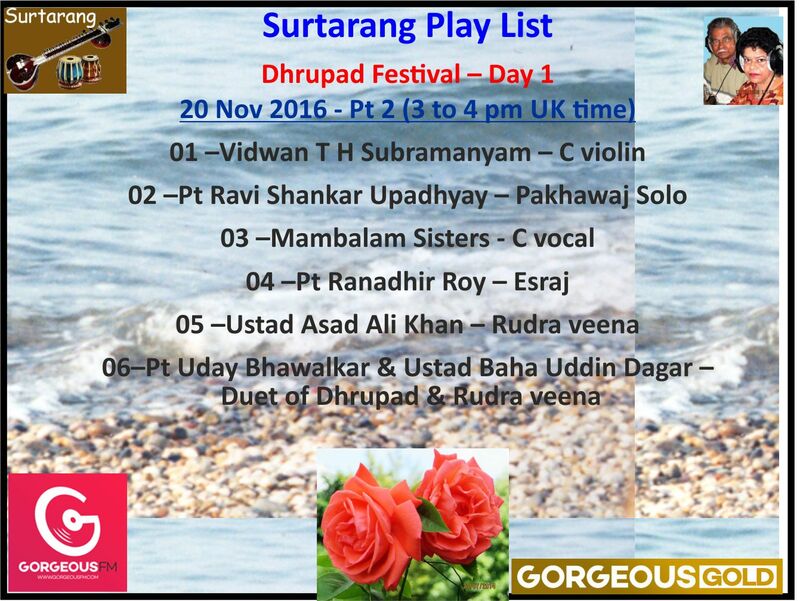 Surtarang is ready to celebrate the Dhrupad Festival. 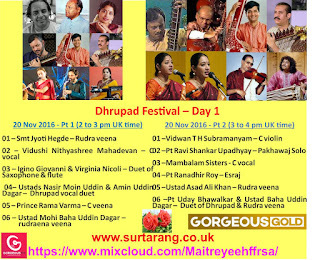 Dagar Gharana is a dhrupad-based stylized singing founded by Ustad Behram Khan (1753-1878). Tracing its history back to nineteen generations, we can say that the Gharana took firm roots under the able supervision of Ustad Behram Khan, who went to Jaipur and founded his gurukul. 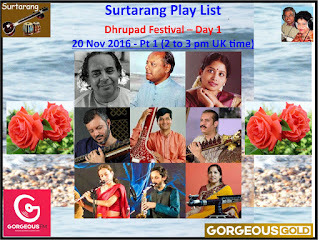 The greatness of his contribution to Dhrupad is admitted on all hands. The Dagar family had seven performing members and held an annual Dagar Saptak Festival in different parts of India. Ustad Nasiruddin Khan had an early premonition of his own death and spent ten years training his two elder sons Moinuddin and Aminuddin so as to impart all his musical knowledge to them. Subsequently, after Ustad Nasiruddin Khan's demise the two brothers trained under Ustad Riyazuddin Khan and Ustad Ziauddin Khan Dagar. Ustad Nasiruddin Khan’s two elder sons were known as the Senior Dagar Brothers. The eldest son of Nasiruddin Khan and a charismatic performer who together with his younger brother Nasir Aminuddin Dagar attained fame in the 1950s and ‘60s as the Senior Dagar Brothers. His singing came the closest to that of Nasiruddin Khan, according to many who had heard Nasiruddin Khan. He trained under his father till his death in 1936, and subsequently, learnt from his uncles Riyazuddin Khan and Ziauddin Khan. His style was characterized by a certain flamboyance, and there were always surprises in the sudden unexpected turns that his melodic improvisation could take. His concert tour of Europe with his younger brother in the 1960s earned great critical acclaim. He had amazing mastery over the use of the three different kinds of head resonance-nasika, anunasika and nirrannasika, which he used with much flair and artistry on the higher notes like ni and sa. His use of rapid ghamak patterns in the faster part of the alap created some controversy, because this led to the accusation that he had adopted some elements of khayal in his singing. But he defended its use by saying that the patterns, though very rapid, were syllabic and different from the aakar taans of khayal. Like his father Nasiruddin Khan he died in the prime of his career in 1966, probably from the same hereditary ailments that caused his father’s early demise-the progression of his illness no doubt accelerated by his fondness for the rich non-vegetarian cuisine of the Dagar family. Recently, some recordings of his singing have been released from the private archives of the Royal family of Udaipur. Ustad Nasir Aminuddin Dagar (Indore, India 1923 - Kolkata, India 2000) was an Indian dhrupad singer in the dagar-vani style. He is also remembered as the younger brother in the legendary jugalbandi or duo of Senior Dagar Brothers. He along with his elder brother Ustad Nasir Moinuddin Dagar was responsible in reviving the dhrupad tradition that had fallen to a nadir after the death of their father Ustad Nasiruddin Khan Dagar. Young Aminuddin gave his first performance at the age of eleven. It was, however, the 1940s that saw the meteoric rise of Moinuddin and Aminuddin as the Senior Dagar Brothers—two of the brightest stars in the Dhrupad firmament. 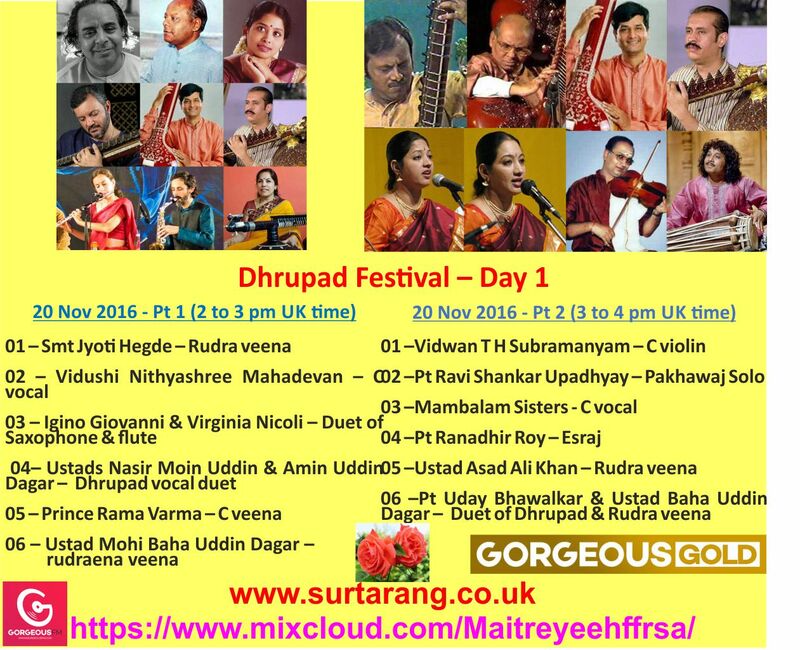 Within themselves they not only transformed the art of Dhrupad singing but also breathed new life to the form of duet or jugalbandi singing. Previously, jugalbandi in the field of classical music had degenerated into a competition between the two singers where each tried to outdo the other in exhibitionism. Moinuddin and Aminuddin on the other hand brought back the concept of a harmonious synchronization between the two singers. 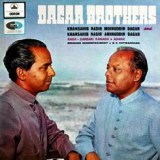 In a typical performance by the Senior Dagar Brothers, the honey rich voice of Aminuddin will draw the audience into a deep meditative mood by gradually descending the notes of the lower octaves and Moinuddin would dazzle the listeners with his alankars or ornamentations in the upper octave. 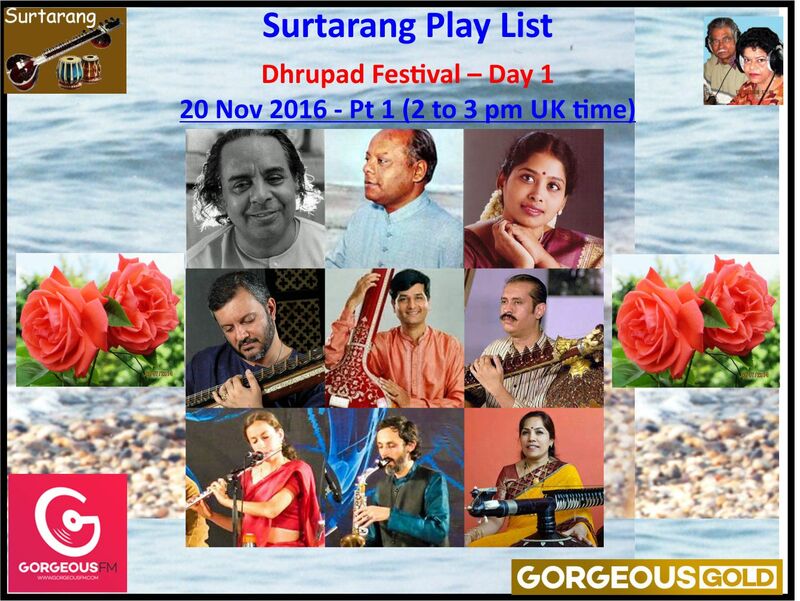 After having established Dhrupad in a pedestal of glory in India, they were invited to perform abroad. The two brothers visited Russia and Japan mesmerizing the audience of both East and West with their divine music. Their music proved to be so charming that Alain Danielou the renowned musicologist and the then director of UNESCO invited them to tour Europe and perform under the UNESCO banner in Berlin, Venice and Paris. 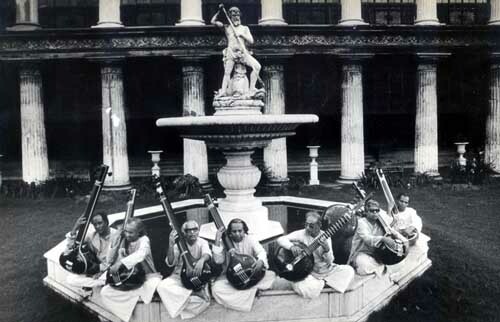 In 1964 the European audience listened enthralled to their singing and newspaper after news paper declared the glory of Dhrupad and of the Senior Dagar Brothers. A review of their performance published in Le Monde of Paris dated 17 November 1964 perhaps best expresses the mood of the western audience: “... we will remain under the deep impression of an art of such greatness and intensity that... we feel touched and moved to the deepest of our being.” Ustad Nasir Moinuddin Dagar died soon after this concert in 1966. Aminuddin who had regarded his brother as his greatest guru and his father substitute was left completely devastated but he continued his journey as a solo performer. Zia Mohiuddin Dagar (14 March 1929 – 28 September 1990), popularly known as Z. M. Dagar, was a North Indian (Hindustani) classical musician, one of the 19th generation of Dagar family dhrupad musicians. He was largely responsible for the revival of the rudra veena as a solo concert instrument. Mohi Bahauddin Dagar (born 1970) is the rudra veena player and son of famous north Indian musician Zia Mohiuddin Dagar. He plays rudra veena with the dagarbani style. He represents the 20th generation of Dagar lineage, referring to Nayak Haridas Dagar of the 16th century. However, he traces his ancestry to Baba Gopal Das, who converted to Islam and became Baba Imam Baksh in the 18th century, making him the representative of the 8th generation. In 2012, he was awarded the Sangeet Natak Akademi Award, the highest award for performing artists, conferred by the Sangeet Natak Akademi, India's National Academy for Music, Dance and Drama. Mohi Bahauddin Dagar started learning the veena from his father when he was 12 years old. After the demise of Zia Dagar in 1990, he continued his training under his uncle Zia Fariduddin Dagar. In the field of contemporary dhrupad singing, the Dagar Brothers are legends. Since there have been a succession of Dagar Brothers, a little chronology may help to prise them apart. The family had been court musicians in Indore. In 1936 Nasiruddin Khan Dagar died at the age of 41. His eldest sons, Moinuddin and Aminuddin, continued the family tradition of singing dhrupad and were responsible for introducing this austere, stately form to western ears. In 1966 Moinuddin died and Nasir Zahiruddin Dagar (1933-1994) and Nasir Faiyazuddin Dagar (1934-1989) took over. It was their work in particular that made such an enormous mark on Indian music lovers. Ustaad Sayeeduddin Dagar is the living legend of the Dhrupad style of music. Known for his enchanting voice culture, Ustaadji is the foremost performer of Dhrupad today. Ustaadji belongs to the 19th generation of the renowned Dagar family or Dagar Gharana. He is the youngest of the famous seven “Dagar Bandhus” and has dedicated his life to keep this ancient tradition alive. Born in Alwar, Rajasthan on 29th April, 1939, he started his musical journey at the tender age of six. His first guru was his father Ustad Hussainuddin Khan Dagar. After the death of his father in 1963, he trained with his uncle Late Padmabhushan Ustad Rahimuddin Khan Dagar. Later he studied under his brothers. In his humility, he yet considers himself a student of Dhrupad. Ustaadji has performed at some of the most prestigious venues and festivals in India and abroad. 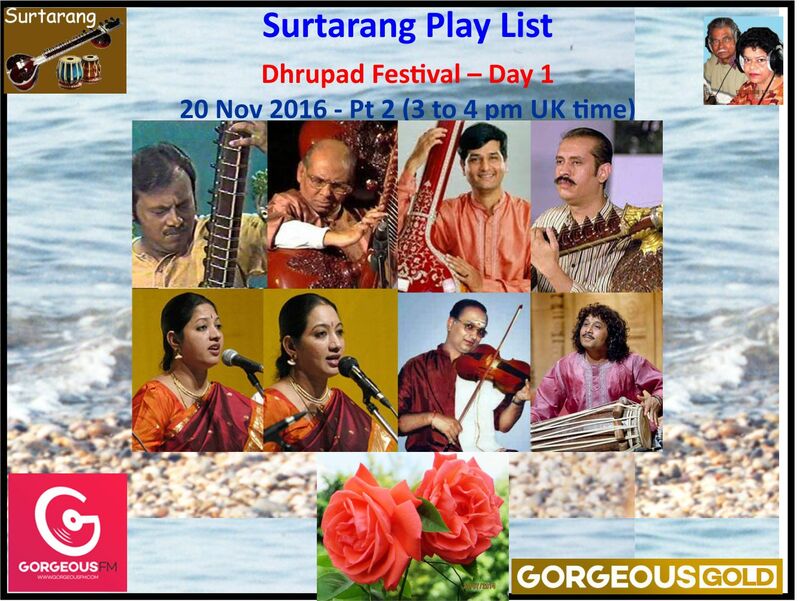 These include the Tansen Samaroh, Savai Gandharva, Dhrupad Samaroh, Dhrupad Mela, Dagar Saptak , Dhamar Samaroh to name a few. Since 1999, He travels to Europe and has enthralled audiences with his performances. His performance usually begins with a Ganesh Stuti and ends with Shiv Tandav. He also sings traditional Laxmi Stuti and such. In many of his concerts a unique phenomenon is observed. When he is singing in the lower octave – the Kharaj Saptak; the window panes start vibrating!!! He never decides which raag he is going to sing before the concert, as he shall sing that raag which his 400 year old taanpuras will create in that atmosphere. “My Taanpuras tell me which raag to sing” he says! He is currently the President of Dhrupad Society Jaipur and Pune. Through these forums and his recordings, he facilitates the spread of this unique art form across the world. He conducts workshops and interactive lecture demonstrations on Dhrupad in India and twice a year in Holland, Germany, France and Belgium. His students are spread around the world. Ustad Sayeeduddin Dagar has groomed his sons into the 20th generation of Dagar Vani performers. Nafeesuddin and Aneesuddin Dagar are the sons of renowned Dhrupad master Ustad Sayeeduddin Dagar. They represent the 20th generation of the Dagar lineage and are worthy heirs of the Dhrupad tradition. Dagarvani Dhrupad can be traced back to the Prabandh and even to the Sam Veda. All the other forms of Classical Indian music are derived from Dhrupad. It essentially means meditation or prayer through music. Born in 1975 and 1976 respectively, the duo began their tutelage under the guidance of their father and their uncles Ustad N. Zahiruddin Dagar & Ustad N. Faiyazuddin Dagar, known all over the world as Dagar Brothers. At present they are learning music under the guidance of their illustrious maternal uncle Ustad R. Fahimuddin Dagar as well as with their cousin Faiyaz Wasifuddin Dagar. Keeping to tradition, the duo gave their first performance at their ancestral place in Jaipur. After the concert, they were proclaimed as today’s “Dagar brothers”. Subsequently, they have performed at several prestigious venues such as Dhrupad Samroh, Swami Haridas Sangeet Sammelan, Kal ke Kalaakar, Dhrupad Mela and Swar Vilas. One of the most memorable concerts was preceded by Bharat Ratna Pandit Bhimsen Joshi where the brothers were presented with a pair of Tanpuras by the Maestro. 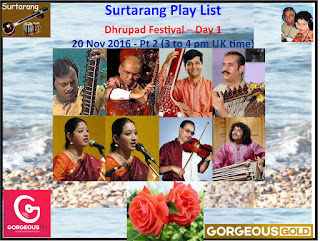 They have also toured Europe several times and have dedicated their lives for Dhrupad. 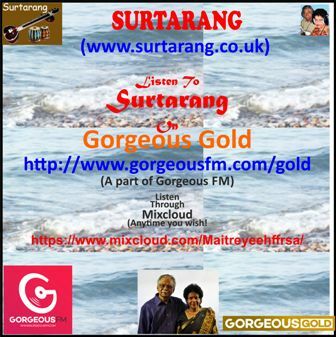 & our own channel http://www.youtube.com/user/surtarang11 & let us have your feedback. 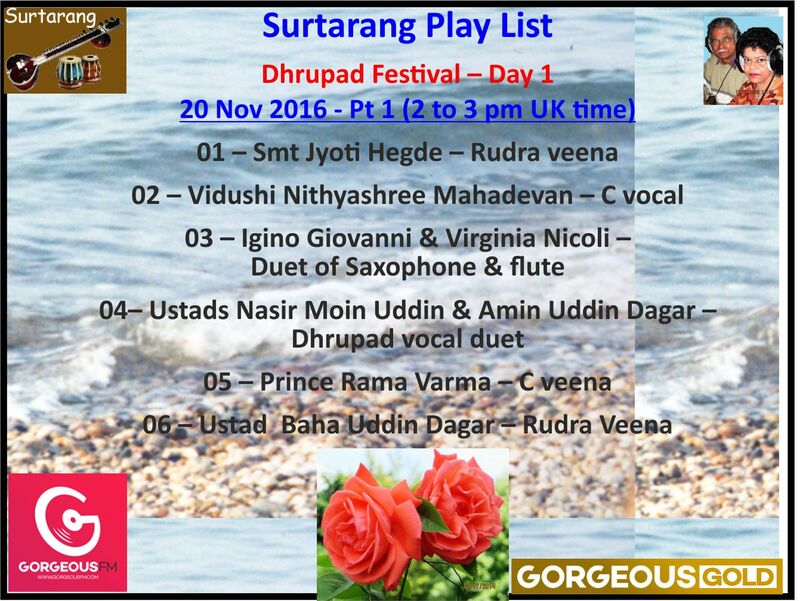 Surtarang taking 'RaGa Music' across the world.